Supplier & Manufacturer of Silicone Coated Fabric. Our product range also comprises of Acid Resistant Linings, Ceramic Fiber Product and High Temperature Resistant Textiles. Being a client-centric organization, we strive to bring forth a comprehensive range of top-notch quality Silicone Coated Fiber glass Fabric. 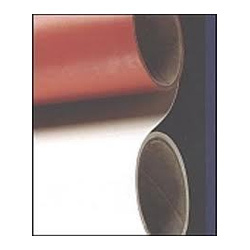 Designed & developed in compliance with industry laid standards, our Silicone Coated Fiber glass Fabric, tape and belt find applications in various industrial processes. Available in standard rolls, the range of Silicone Coated Fiber glass Fabric is stringently checked and tested prior to its delivery to ensure its defect-free nature and superior quality. Looking for Silicone Coated Fabric ?